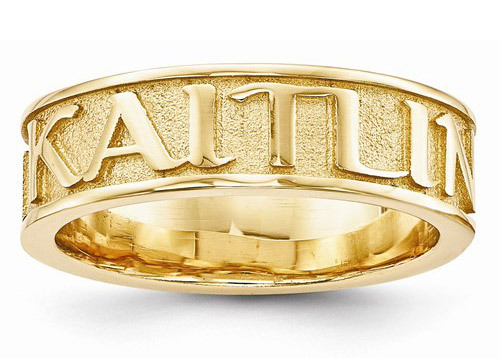 This fashionable and finely crafted name band has a textured, sandblasted background, with your name or the name of your loved one embossed on the front of the ring in 14k yellow gold. Each ring is custom made to order and ships within 7-10 business days, as each band is individually made to order. Band weighs approx. 6.62 grams of 14k solid gold. Our custom textured band is also available in sterling silver, which is shown below. This ring is perfect as either a stand-alone personalized name ring or as a fine 14k gold custom wedding band. We guarantee our Textured Custom Name Band Ring in 14K Yellow Gold to be high quality, authentic jewelry, as described above.